In the food service industry, many factors dictate your success. This includes freshness, taste, affordability and innovation. However, the most important factor for any food business is the heat of the food. Serving cold food to a customer is a sin of the highest order. Luckily, this can easily be avoided with the use of a good commercial microwave oven. When it comes to restaurants and food service industries, the Panasonic NE-1054F commercial microwave oven is the complete package. This oven is great for use inside a fast food chain. Especially here it proves itself to be the most useful due to its fast heating. The Panasonic NE-1054F commercial microwave oven is designed with the time constraints that come with preparing food on a commercial basis in mind. In this review we’re taking an in-depth look at what makes the Panasonic NE-1054F commercial microwave oven an ideal fast food chain microwave oven and why you should consider buying it. This oven comes with an output power of over a 1000 watts, which is a very great power for a commercial oven. 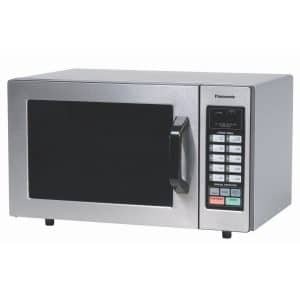 The capacity of the Panasonic NE-1054F commercial microwave is quite large at .8 cubic feet, making it big enough for easily heating large containers or food. This unit may look small, but can hold the biggest dishes and baking trays inside of it quite easily, which makes this a perfect and necessary addition inside of a food outlet. Although the capacity and power of this oven alone are enough to sway most consumers, some people complain about the lack of a turning tray inside of it like in other microwaves. While it is true that most microwaves, even the commercial variety, come equipped with turntables these days, it is by no means a necessity. The even penetration of heat into the core of the food has little to do with the food turning inside of the microwave. The Panasonic NE-1054F commercial microwave has heating technology that can penetrate deep within the food and heat it without having to turn the food around. Since the Panasonic NE-1054F commercial microwave offers a complete package for an affordable price, this is a minor drawback that can easily be overlooked. An additional technical specification they have to counter the lack of a turntable is the bottom oriented heating source. Unlike most microwave ovens, the Panasonic NE-1054F commercial microwave emits heat from the floor of the oven, instead of the sides. This ensures a much quicker and thorough heating of food that simulates the heating capabilities of a stove top. Along with this, the capacity is even greater without their being a turning tray taking up all the space. This means you can heat a lot more food at a much faster rate, which makes this ideal for use in commercial food chains. The Panasonic NE-1054F commercial microwave comes with 10 touch keys you can use to control different aspects of the microwave. The timer controls go from 30 seconds all the way up to 3 minute and 30 seconds. These timer controls give you flexibility when planning out the heating of different kinds of meals. There is also an option to cook different meals in a 2-stage or 3-stage procedure as well. The best thing about the controls is the ease of use – even for people who don’t learn as fast as others. All the keys on the control panel are coded with Braille which makes using this microwave even easier for your kitchen staff. If you are someone who runs a restaurant or fast food outlet, the Panasonic NE-1054F commercial microwave is perfect for you. What makes this oven optimal for use by fast food operators? The answer to that lies in the versatility and simplicity of this unit. This oven has all of the standard features that one expects from a commercial microwave oven. With the dearth of features that come with the Panasonic NE-1054F commercial microwave, it’s price seems like a bargain that is entirely too good to be true. Here are some key things which make the Panasonic NE-1054F commercial microwave better than its competitors. The following points should make this oven the right choice for you. What are the drawbacks of the Panasonic NE-1054F Commercial Microwave Oven? 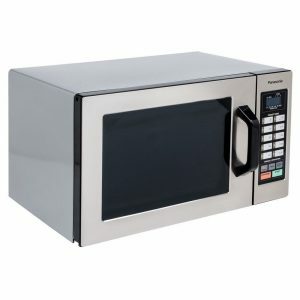 The Panasonic NE-1054F commercial microwave is very good package for someone running a fast food joint. There are a few drawbacks pointed out by some customers that should be taken into consideration though. If you’re running a demanding business with lots of customers, the Panasonic NE-1054F is the perfect choice for you. Its powerful heating and many options makes it suitable for almost any task. The Panasonic NE-1054F is a very energy-efficient unit with a very affordable price tag. A spacy interior guarantees that you can heat even big batches of food at once. On top of that, Panasonic is well-known for their quality support. If your unit ends up being faulty or does not live up to its promise, Panasonic will assist you. Everything taken into account, the Panasonic NE-1054F commercial microwave oven is perfect for any situation. You can use it in your home as a part time substitute for your oven. If you’re in a busy business environment, the Panasonic NE-1054F will live up to your demands as well. Built to sustain and heat in a hurry, this unit is bound to amaze. Keep calm and heat that food! Buying warranty for kitchen supplies is always a good idea. We have written an article on which warranty to buy to fit your needs. You can read our article right here. If you’re not quite sure about with commercial microwave oven is right for you, we’re here to help. Read our best commercial microwave ovens guide and learn more!